PCI-DSS provides organizations that accept, store or transmit credit card data with security guidelines to protect cardholder data. Financial institutions, online retailers, and tech companies developing apps and tools that serve online businesses must meet PCI standards and validate their compliance each year. PCI is one of the most challenging security standards to meet. Now on version 3.2, PCI DSS is getting more stringent. It now impacts companies that directly touch card data as well as their business partners. 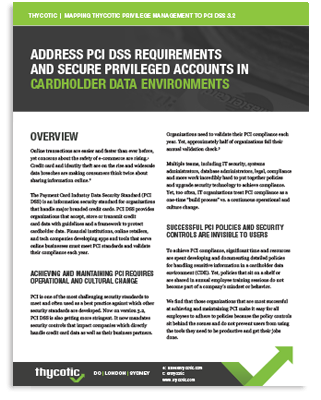 Without adequate security controls to protect your privileged accounts, you will not pass your next PCI audit. Get our guide to PCI-DSS to see how your privilege management practices map to compliance requirements. Thycotic software can help your organization meet PCI regulations, with a primary focus on PCI-DSS v3.2 requirements 2,5-8, and 10.